For those entranced by Guillermo Del Toro’s recent Pan’s Labyrinth (2007), here is that film’s spiritual forefather, and one of the great masterworks of Spanish cinema. 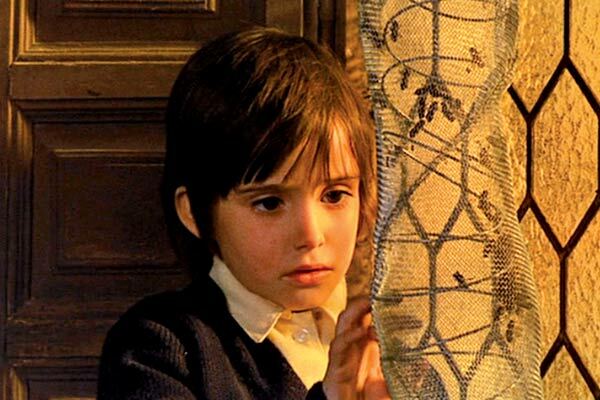 Made in the last years of the Franco dictatorship, what is surprising about The Spirit of the Beehive is just how much Victor Erice managed to slip under the censors’ gazes and onto the screen, even if cloaked somewhat in allegory. Beyond this political context lies one of the greatest films, if not the greatest, to examine childhood innocence and its slow surrender to the real world. “Once upon a time”, the opening titles describe, setting up the mythical, more mystical side of the film’s narrative. A vehicle pulls into a small village in rural Spain, which a group of children excitedly gather around. Its precious cargo is the reels of film containing James Whale’s horror classic Frankenstein (1931), which on projection hold the youngsters spellbound. One girl, the impressionable Ana, is left, mystified by one particular scene: when the monster is taught by Little Maria to throw flowers into the river, only for him to throw her into the waters too. Why did he kill her, Ana enquires of her sister, the older Isabel, who toys with her younger sibling by suggesting the monster lives in a nearby sheepfold, and may be summoned if Ana calls for him. The year is 1940, and the other side of the film is framed by context of the location: the dusty plains of Castile. By this time, the Spanish Civil War had long been won by Franco’s Nationalists, but beginning were the small-scale Maquis Republican guerilla operations which would last well into the next decade. What becomes more noticeable throughout the screentime is the absence of young men from the town, whether killed in the violent, bloody conflict just ended, or participating in the wider European conflict of the time. The few we do glimpse are on trains, whether bound to or from the lines of battle. One young man will eventually enter the story, though, which will have its own inevitable consequences. Ana and her sister live with their parents: their father, an older man who silently tends to his beehives, observing and writing about their microcosmic patterns of life, as well as taking the girls on walks in the country explaining to them about the ways of the natural world. Their mother, much younger than he, daydreams and writes long letters to a lost lover who is away fighting, and quite possibly dead. Though both the father and the mother are loving to their children, they are clearly no longer communicative to each other, and their respective preoccupations allow the girls time and room to roam around and play. The young Ana, given this somewhat free reign, is allowed to be led astray by Isabel, roaming around the countryside and playing on the nearby train tracks. Isabel is older, more worldly-wise than her younger, more impressionable sister, and plays a number of tricks on her; some critics have pointed to their cruelty, yet for me are typical of the type young siblings play on each other. The two sisters illustrate the transition into adulthood: the older sister playing with ‘adult’ things like lipstick and shaving brushes, losing the innocence of childhood, while the younger sister, still learning about the world and life, at the mercy of the limits of her imagination. There is undeniably some subtext here about the loss of Spain’s innocence in the blood soaked years of the late 1930s, which saw brother killing brother, but it is the film’s sense of enigma which allows interpretations to be drawn without being forced. Part of the film’s wistful air can be certainly laid down to the remarkable cinematography; Bergman-like interiors are bathed in light streaming through the hexagonal-patterned (beehive-like) windows, betraying a debt to Vermeer both compositionally and in terms of the rich golden hues. Exterior shots are similarly rich in colour, the Castilian plains as full and golden as anything we would later see, for example, in Terence Malick’s spectacular Days of Heaven (1978). Cinematographer Luis Cuadrado was slowly going blind around the time in which the picture was shot, and it is all the more remarkable that the subtle nuances of chiaroscuro indoors, as well as the more grandiose outdoor shots, are as superbly photographed as they are. As much as the film is memorable for its visuals, what stands out equally is the central performance of Ana Torrent, later to make an equally memorable impression in Carlos Saura’s Cría cuervos (1976), and who continues to work in Spanish cinema to this day. It is a demanding role for any actor, with most scenes communicating emotion through facial close-ups rather than dialogue, yet her visage – full of wonder and sadness, inquisitiveness and fear – seems to sum up a lot of what childhood is about. The parallel with Pan’s Labyrinth would be that much of what Ana fears in the world is what her imagination creates, yet this allows her to deal with real-world problems with much more ease – much like Del Toro’s protagonist. The Spirit of the Beehive won its director much acclaim, but Victor Erice has since gone on to make only two subsequent feature films. A little strange, maybe, given Spain’s increasing moves towards liberalization, openness, and artistic freedom. But then again, perhaps he managed to say all he wanted to say in this, one of the great films of European cinema, one of the great meditations on childhood, and a poetic allegory of a beautiful country’s sad recent history.